"One of the typical small stations of this region, established by the Southern Railway largely for development purposes. While of little importance at present, the large china-clay deposits nearby, which already are being worked, and the rich soil of the surrounding plateau, promise to make the town of some note in the near future. "From this point, the Railway begins a sharp ascent of the mountains, the altitude increasing more than 700 feet within four miles. Dark River, which dashes torrentially down the mountains through gloomy and precipitous gorges, is crossed twice within the space of one mile. Just beyond the second bridge spanning Dark River lies the picturesque town of Balsam, N.C."
Jackson County Genealogical Society. Jackson County Heritage, North Carolina, 1992. Cullowhee, NC: JCGS, 1992 (Volume 1) and 2000 (Volume 2). McRorie, J.D. 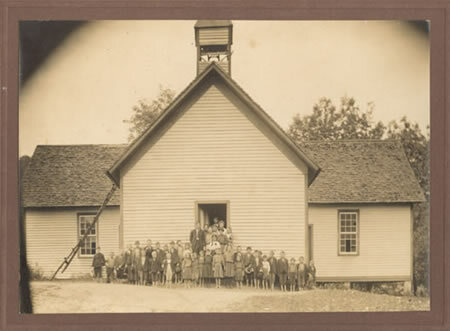 Knowing Jackson County: People, Places, and Earlier Days. Sylva, N.C.: Jackson County Historical Association, 2000. Madison, Robert L., manuscript collection, Hunter Library, Western Carolina University, Cullowhee, N.C.
North Carolina Education Association, Jackson County Unit, Historical Committee. Jackson County Public Schools. [S.l. : s.n. ], 1954. Williams, Max R., ed. The History of Jackson County. Sesquicentennial ed. Sylva, NC: Jackson County Historical Association, 2001.